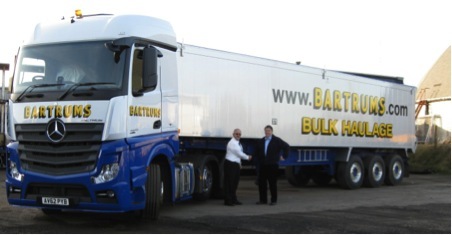 David Reid, Bartrums Transport fleet engineer, takes delivery with the first of a new fleet of Wilcox 70 cu. yard Plank sided tipping trailers ordered and delivered with 385/65R22.5 GT876 supplied as original equipment together with Albert Bartlett, Regional Sales Manager South East of Giti Tire (UK) Ltd.
“The savings made over the last year by using GT Radial on the fleet, plus the high acceptance and good residual value of the G T Radial casing has ratified the decision to specify GT Radial on the new trailers”. The Bartrum Group’s clear focus is on maximizing economy and performance for the fleet leading to this latest investment in new vehicles. This includes 10 new Mercedes 6 x 2 mid lift Actros 2545 MP4 Euro 5 utilising the latest in telematics technology. These are maintained to the highest standards by their in-house purpose built maintenance and repair centre, Trumbar Truck Care Ltd.
Operating over 400 motives and trailers, the Suffolk-based family owned Transport Company specialises in haulage, warehousing and distribution, established in 1929 and providing a diverse range of services offering full and part load distribution throughout the UK to blue chip companies.